I don’t know about you, but I’ve been feeling sort of powerless in the wake of the presidential election. So with the fantastical thinking and intellect of a five-year-old (remind you of an orange-faced someone with bad hair? ), I got to fantasizing about what if I had a superpower (or ten) to make me feel more in control. Telekinesis—I could cause Trump’s hair to get all messed up or his pants to fall down when he’s giving a speech, or hide the nuclear codes should he have a retaliatory hissy fit over some perceived slight by another country. Oh, and make my reading glasses or keys come to me when I can’t find them. Teleportation—I could send Trump and his minions to another galaxy with no way of getting back to Earth. Or I could beam myself to wherever I want to travel, avoiding traffic, crowds and the expense, hassle and germ-laden recirculated air of commercial airlines. X-ray vision—I could observe how Trump, his family and advisors interact when the cameras aren’t on. I’d combine this with super-acute hearing so I could eavesdrop on their conversations, and the ability to preempt regular TV programming and simulcast those conversations live to the world. Plus, I could see through walls to check out how people have decorated their homes. Give whatever you’re able—money and/or time—to organizations that advocate for the progressive, humanistic values you believe in. These groups include the ACLU (https://www.aclu.org), Southern Poverty Law Center (https://www.splcenter.org), Planned Parenthood (https://www.plannedparenthood.org), National Network for Immigrant and Refugee Rights (http://www.nnirr.org), and the Human Rights Campaign (http://www.hrc.org). Call or write legislators and make your position known on issues that are important to you, such as Republican threats to gut Medicare and Social Security, do away with the Affordable Care Act (Obamacare), ignore climate change, restrict women’s reproductive rights, or Trump’s appointment of deplorable cabinet members. Boycott businesses that carry Trump products or espouse hatred in any form. So let’s go. Flex your activist muscles. Push back, call out, speak up, vote, run for office, volunteer, march in peaceful protests. Just don’t remain silent or complacent. Or humorless. 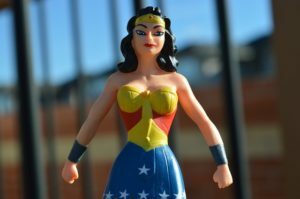 6 Responses to What’s your superpower? I would like to be able to talk to animals, like Dr. Doolittle. I would send messages to all the birds in New York and Washington, and get them to shower Donald Trump with bird poop whenever he says anything stupid or crazy. I would also know what my cat is saying whenever she makes those squeaky little cat noises. That would be a GREAT superpower, Kathy. And I like the way you’d use it! Yes, we do have powers, even we who are too old to be Boomers. Give! Volunteer! I LOVE this post! It’s imaginative and funny, and it has redeeming social value to spare. Thanks, Bill! You’ve got a superpower when it comes to encouraging your fellow writers!